When I first stumbled across Katie Quinn Davies’ blog, What Katie Ate, I knew I had made a tremendous discovery. Her food photos were more beautiful than any I had ever seen — on food blogs, in magazines, or inside the pages of cookbooks. Her photos convey emotions through colors, textures, shadows and light and I was amazed to discover that Katie is a self-taught photographer that developed her skill through lots and lots of practice. The very first dish I chose to make from the book was her Irish Mash. I figured that Katie, being from from Dublin, knows a thing or two about a good mash, and I was craving a comforting meal. The photo, of course, drew me in at first. 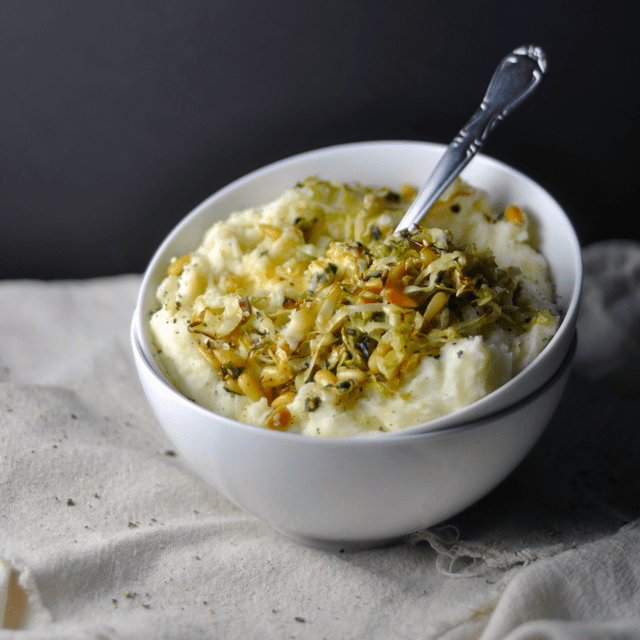 But I noticed a number of interesting twists in Katie’s recipe: it calls for lightly boiled white cabbage, green onions and wasabi paste to be stirred into the whipped potatoes. And the whole thing is topped with a ‘crispy and crunchy’ combination of butter-fried pine nuts, thinly sliced cabbage, green onion and sesame seeds. 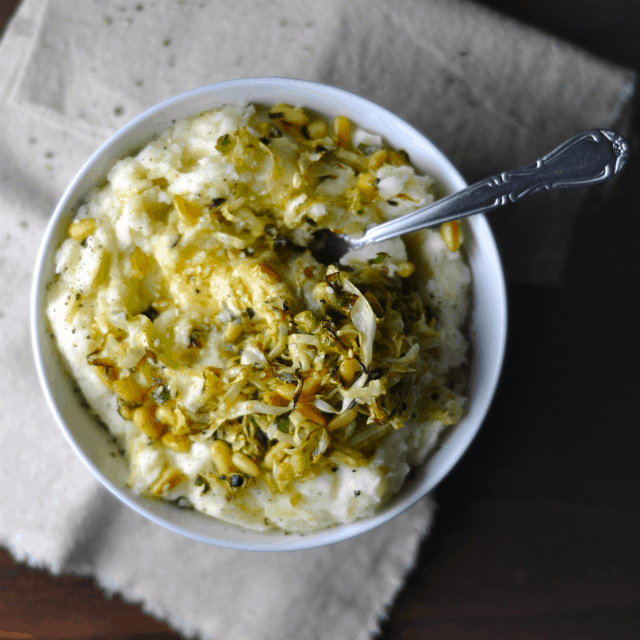 I’ve never thought to put cabbage in my mash before and trust me, the minute I dug into this one, I regretted the years I’ve spent eating boring mashed potatoes. Whether or not you’re a huge cabbage fan, I think you’ll still appreciate the freshness that a few cold weather greens add to the buttery potatoes. If I had one complaint about the recipe as written, it was that I wished there was more topping to go around! Even though I have a giant tupperware of mash left over from dinner last night (we made it for the two of us) the topping is, sadly, all gone. Therefore, I would encourage you to double, or even triple the amount of topping you make, especially if you’re serving a group. If you’re eating leftovers, I’d definitely make the topping fresh as you don’t want to lose that crunch. I urge you to make this mash promptly, or at least add it to your Thanksgiving menu this year. And, if you’re the type to swoon over beautiful food photos and delectable recipes, pick up a copy of Katie’s book, which is now available in the U.S. and Canada (you can also purchase the Australian version of the book which includes measurements in metric). Check out beautiful outtakes from the book (and a video that gives a peek into Katie’s photography process). *Note: I highly recommend doubling the topping recipe. I would also add more sesame seeds to the topping — maybe a tablespoon or so. 1. Bring a large pot of salted water to a boil. Add the potatoes and cook for approximately 30 minutes (or until you can easily pierce them with a fork). Drain and return potatoes to the pot. Use a potato masher (or a potato ricer) to mash them until very smooth. 2. Add the milk and use a wooden spoon to whip it into the mash. Next, add the cream and butter, continuing to vigorously stir to combine. Stir in the wasabi paste and generously season with salt and pepper. Cover the pot and keep warm over low heat while you prep the cabbage and topping. 3. Cook the cabbage in a pot of salted, boiling water for 6-8 minutes, or until tender (but not completely soft). Drain and stir it into the mash. 4. Prepare the topping: melt the butter in a medium skillet over medium heat. Add the rest of the cabbage, pine nuts, sesame seeds and green onion. Cook, occasionally stirring with a wooden spoon, until golden and crispy (5-10 minutes). 5. Transfer the mash to a serving bowl. If needed, you can stir in a little more milk at this stage. Top with a pat of butter and topping. Season with freshly ground pepper. Serve warm. 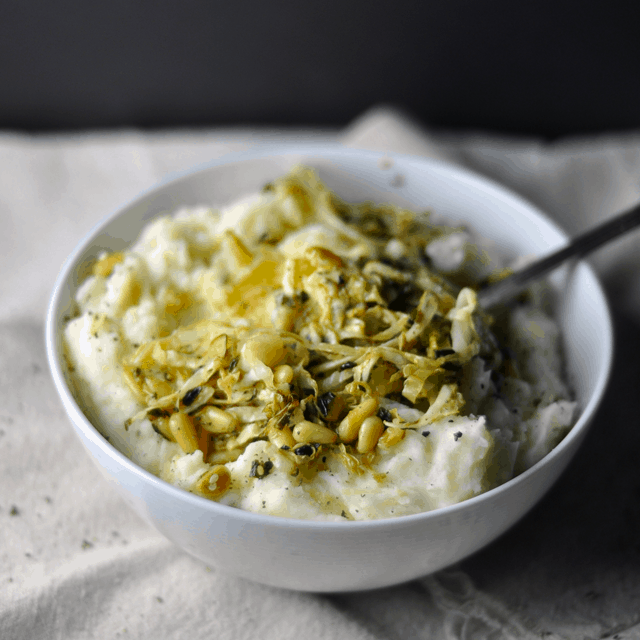 Mash can be reheated (just be sure to add some milk to make sure it’s still light and creamy). I recommend making the topping fresh to go with any leftovers.